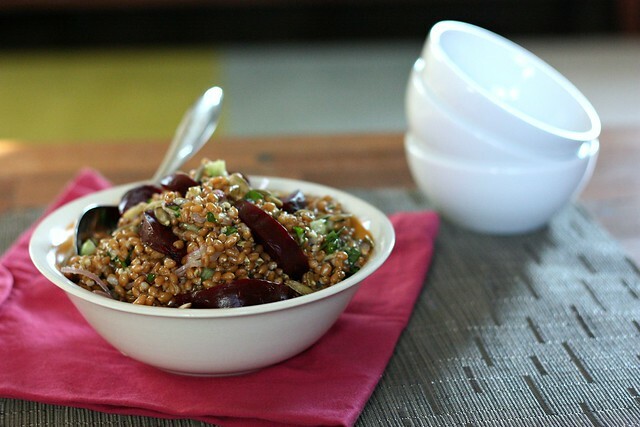 Wheat Berry & Beet Salad with Pumpkin Seed Vinaigrette – Elly Says Opa! You know how there’s all this research now that points to people who think cilantro tastes like soap/tin foil actually having something in their DNA causing that reaction ? I wonder if there’s something similar with beets. I hear people say a lot that beets taste like dirt and they don’t taste that way to me at all. Sure, they are earthy but they are fabulous. Growing up, the beets were my second favorite part of Greek diner salads (after feta, obviously). And now I love them as chips, roasted, or really any way. My whole family likes them. Fuchsia hands after handling them (or eating them, if you are a 22 month old) are their only downfall. I liked the sound of this salad from the getgo. 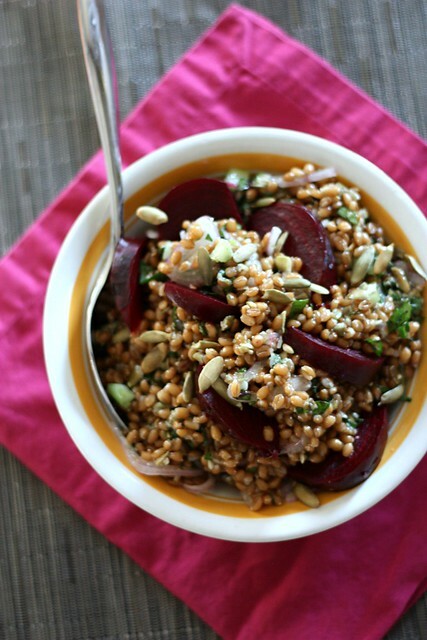 Beside beets, it has wheat berries, which I’ve just started eating more of, and pumpkin seeds, which are so great. Some of the pumpkin seeds are crushed up finely and used in the vinaigrette so their flavor is laced throughout and the rest are sprinkled on top, giving a little texture to the salad. This salad is good at room temperature (how we had it the first day) or cold (how we had it as leftovers) so it’s nice for a gathering because you can make it ahead. This recipe called for celery leaves but I realized too late that the celery in our fridge was just ribs. So, I ended up using the beet greens in their place. Worked wonderfully. Also, my store was out of golden beets, which are sweeter, so I used red beets. If you’re just coming around to beets and you find yellow, that may be an easier transition for you. Leave the root and one inch of the stem on the beets; scrub with a brush. Place the beets on a large rectangle of aluminum foil and drizzle with 1 tablespoon of the oil. Fold the edges of the foil over tightly to seal. Place directly on the rack (with a rimmed baking sheet on the rack below, should there be any drippings). Roast until beets are tender, about 1 hour. Set aside until cool enough to handle and then remove the stem and peel. Cut each beet into 6 wedges or so. Meanwhile, place wheat berries in a saucepan with 2 cups of water and a small pinch of salt. Bring to a boil. Cover with a lid, reduce to a simmer, and cook until wheat berries are plump and tender, about one hour. Place 1/4 cup of the pepitas in a large bowl (or in a mini food processor) and coarsely crush with the back of a wooden spoon (or pulse a few times, if using the food processor). Whisk in the honey, Dijon, vinegar, and salt and pepper to taste. Add the remaining 2 tablespoons of oil while continuing to whisk. Add the wheat berries, celery, shallots, chives, beets, and leaves/greens and toss gently to combine (note: red beets will turn the salad red if not gently tossed; if you want to prevent this just stud the salad with the beets after you’ve combined everything else). Season with additional salt and pepper if necessary. Top with remaining 1/4 cup pepitas.